July 10, 2017 (LBO) – Food and Agricultural Organization of the United Nations (FAO) with the Ministry of Education kicked off a project where schools develop their own garden for child nutrition and life skills. “School gardens can be used as a classroom by reconnecting children with the outdoors and the source of their food,” said Nina Brandstrup, FAO Representative. The first event took place in the context of the project on “Scaling up Nutrition through a Multi-Sector Approach”, jointly implemented by FAO and the World Food Programme (WFP) in collaboration with government. Through this project, more than 6,000 schools have been inspired to create their own organic and healthy garden within the school grounds. To support each school develop their own garden, FAO together with the Ministry of Education have facilitated a series of training workshops in all nine provinces, training 377 education officers. They have been provided a guideline and manuals which teachers, parents and children can use in establishing the school garden. FAO has distributed gardening tools and resources to participating schools across the island to support the project’s sustainability. A manual available in both Sinhala and Tamil has been crucial to the success of the initiative, and has reached over 300,000 children across the island. In many parts of the country that continue to struggle with food insecurity and under nutrition, this initiative has supported children to take responsibility for their diets and share their learnings with their families and the wider community. Commenting on the programme, Jayantha Wickramanayake, Director of National Schools said this programme really takes education beyond the classroom, guiding students to form a relationship with nature. 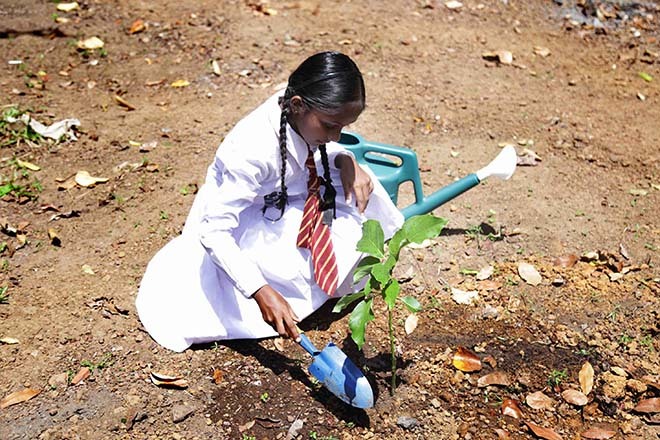 School gardens are one aspect of the Scaling up Nutrition through a Multi-Sector Approach project, jointly implemented by FAO and WFP in collaboration with the Government of Sri Lanka. The project is part of the United Nations Sustainable Development Goals Fund, an international multi-agency and multi-donor development mechanism created in 2014 by The United Nation Development Programme (UNDP) funded through the Government of Spain.